The first ComRes phone poll since the end of September is out tonight for tomorrow’s Independent and shows several changes. 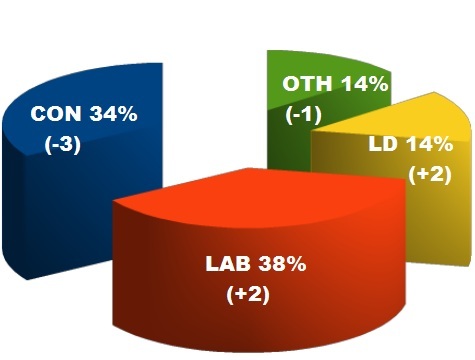 Notably Labour are back in the lead and the Lib Dems are moving forward. The 14% for Nick Clegg’s party is the best the party has seen from the firm since May and the second highest share in a year. This will come as something of a relief to the yellows following that YouGov poll at the weekend that had them only one point ahead of UKIP. The loser has been the Conservative party. In other findings 56%, including 38% of Tory supporters, believe that the Tories are now more divided than the previous government, while 32 per cent of people disagree; 75% would like the opportunity to vote in a referendum on Britainâ€™s relationship with the EU, while 17 per cent disagree and 55% believe Mr Cameron is out of touch with public opinion on Europe, while 33% disagree. Does Salmond have a woman problem as well? 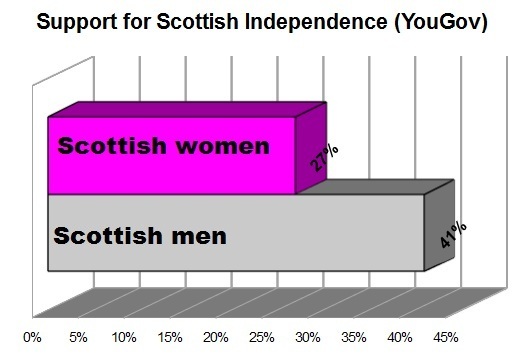 Why the gender gap on independence? In recent weeks there’s been a lot of discussion about the gender gap in attitudes to the Conservatives and their leader, Mr. Cameron. Poll after poll has shown that men are more favourable than women. Well Alex Salmond seems to have a similar challenge in Scotland over attitudes to independence – which will, of course, be subject to a referendum. 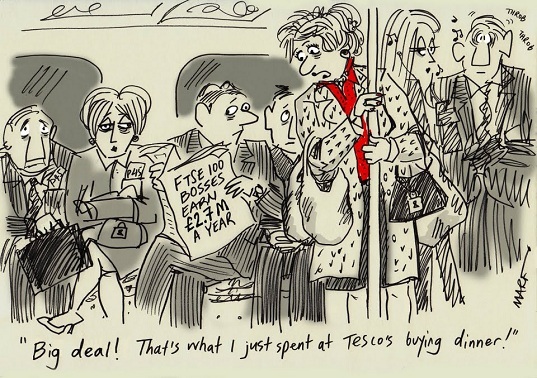 Men, it appears are much more enthusiastic than women – 41% to 27% in the latest YouGov polling north of the border. As was highlighted by Professor John Curtice this difference has been seen before in other polling but now it has become particularly large. He also pointed to the class difference on the issue observing that the SNP leader has to win over many middle-class voters. “Only 31 per cent of the former back independence, compared with 36 per cent of the working-class electorate. My guess is that the former would be much more likely to vote in a referendum. UPDATE: The poll also shows that 1 in 5 SNP Holyrood voters say they would vote NO to independence. Just 69% say they would vote YES. Is another non-Romney contender biting the dust? There’ve been sharpish moves on the Republican nominee betting markets overnight following allegations on Politico that at least two female employees had complained about inappropriate behavior by Herman Cain when he’d be running the National Restaurant Association in the mid-1990s. 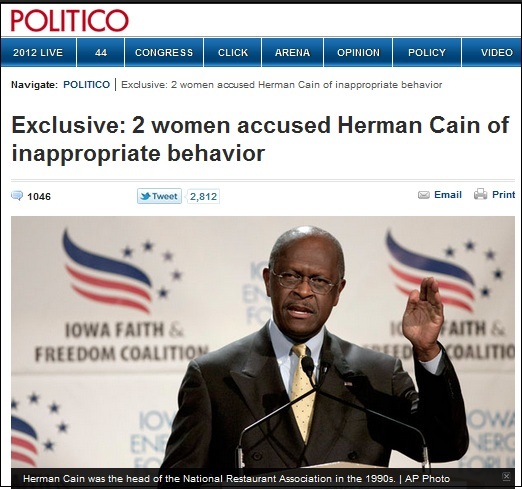 The report says that the women complained of “sexually suggestive behavior by Cain that made them angry and uncomfortable”. Cain’s campaign has attacked the reports but it’s hard to conclude other than this could be the end of his unlikely bid for the White House. At one stage Betfair had him at 6/1 – the last price traded was just on 19/1. Interestingly there’s been almost no movement in the Mitt Romney price who the markets still rate as a 65% chance – a level that I regard as far too tight. The rush to Cain over the past month had never been convincing and I had kept out – but I’m still uncertain about Romney. The fact that he’s there almost by default isn’t encouraging for someone priced so tight. One of the other contenders, ex-favourite Perry perhaps, might re-emerge. The first real voting in the prolonged primary process is more than two months off and a lot can happen in the intervening period. 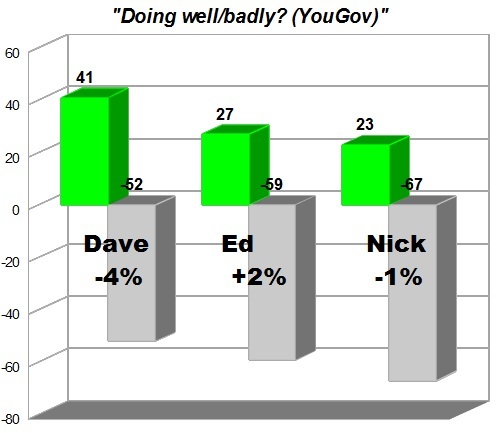 The chart shows this week’s leader ratings by YouGov for today’s Sunday times with the figure highlighted being the net change for each on a week ago. Given the way the commons EU vote has been reported the Cameron camp might have expected something worse than just a -4% net change. The voting intentions in the poll had 39/36/8. UKIP were on 7% just one point behind the Lib Dems. The VI question, like with all the pollsters, asked how people would vote if there was an “election tomorrow”. I wonder when they are going to switch from the theoretical to the actual. The date has been fixed by law, of course, for May 7th 2015. I suspect that this would produce a massive increase in don’t knows. Still the purpose of VI polling as well as the regular leader ratings is to take the political temperature. What does Guido’s hanging petition say about salience? When Guido launched his e-petition on capital punishment three months ago I thought it an odd thing for his blog to be doing – but I had little doubt that he’d reach the 100,000 signature threshold within the laid down six month period. I was also confident that the anti-Guido move launched on the same day would get overwhelmed. For whenever the restoration of capital punishment has been polled then there’s usually a big majority for bringing it back and surely there’d be 100,000 out there ready to sign up? Guido’s move was helped by getting a lot of coverage in the national press as well as the strong backing of at least one paper. The chart above shows what’s happened. Guido’s petition continues to lag behind and it’s hard to see it attracting enough support by early February to qualify for consideration for a commons debate. The reason, I’d argue, is that supporters of the ban on hanging feel more strongly about it than those who want the death penalty restored. 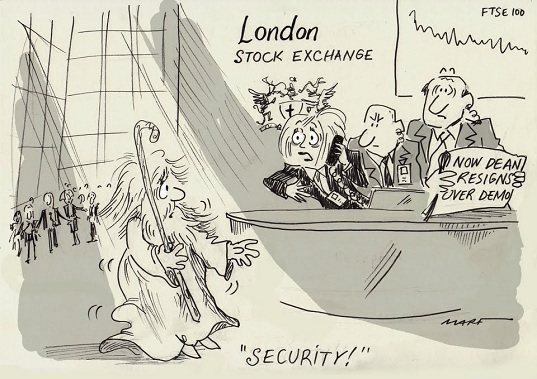 Isn’t this a bit like attitudes towards the EU – something that we’ve argued about a lot this week? People might be opposed and tell pollsters that they want out but what evidence there is suggests that they don’t feel that strongly about it. 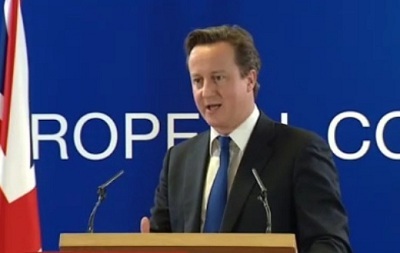 Will the European question bring Cameron down ? How does the Coalition navigate a new EU treaty? Considering that domestic matters are the bread and butter of politics, itâ€™s surprising how often foreign affairs play a significant part in their leaving office. Of the last four, Thatcher and Major both failed to navigate divisions over Europe, Blair never recovered from Iraq. The combination of the referendum vote in parliament this week and the possibility of a new treaty to increase the institutional control within the Eurozone should therefore be sounding alarm bells in Downing Street. Of itself, the referendum vote is the less important. The focus has been on the scale of the rebellion, which was indeed very large, but thatâ€™s just one factor in determining the potential for damage; the others are the depth of division and how long the battles would drag on for. With nowhere much to go and with the overwhelming majority of Conservatives wanting a looser relationship with the EU â€“ the divisions are more over pace and ultimate destination rather than direction of travel â€“ had the vote been an isolated event, it would soon be forgotten. Even so, itâ€™s probably not coincidental that Labourâ€™s lead has increased this last week. The referendum vote clearly showed a divided party â€“ never a popular thing â€“ and reminded people of the apparently broken promise about the Lisbon Treaty (whatever the truth may have been, what matters is the popular memory). When the Act establishing the referendum lock was passed, the thinking was presumably that after Lisbon there wouldnâ€™t be a new treaty for years anyway. Rather like the Lisbon referendum â€˜promiseâ€™, events may not turn out as envisaged. If there is to be a new treaty, then the European question is clearly not an isolated event, and Cameron will have extreme difficulty holding the disparate forces in the coalition together. Clegg made it clear in an interview that he opposed any repatriation of competences from the EU to the UK. I am sure that would simply be unacceptable to so many Tory MPs that if Cameron agreed a treaty with no repatriation of some powers, he could not carry ratification without opposition MPs. Such a situation would almost certainly lead to a least a vote of no confidence in him taking place, which even if he fought off would leave him deeply scarred. The main alternative â€“ to emulate Thatcherâ€™s rebate and â€˜get our control backâ€™ over some areas â€“ would create tremendous strain within the coalition. Cameron and Hague might bank on a deal that included withdrawal from the CFP being popular enough with the Cornish Lib Dems (or at least, with their constituents) that thereâ€™d be sufficient pressure to keep both parties on board. But first heâ€™d have to negotiate such opt-outs, on which other EU members, never mind the Commission, wouldnâ€™t be keen. The third option â€“ to negotiate such a hard line that no agreement was possible â€“ would incur the wrath of other EU members and his coalition colleagues, and lead to renewed market turmoil for which heâ€™d be the fall guy. Such a situation would be close to untenable unless other EU members could clearly be cast as more unreasonable. Then thereâ€™s what happens about ratification. It would be possible to argue that a treaty that returned powers to Britain need not be subject to a referendum. That might be the legal position but it would be a tough sell to the public. 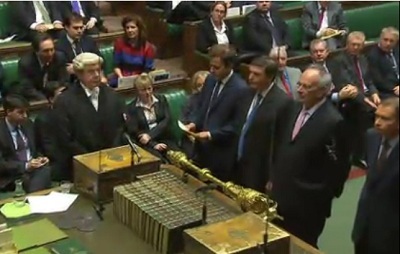 There would undoubtedly be an amendment moved in the ratification debates to hold a referendum and if the government opposed it, it would likely prompt a massive rebellion, leaving Cameron reliant on Labour MPs to see it off â€“ if that was Labourâ€™s stance (Labour and Miliband would have their own dilemma as to what position would be most in their interests). Winning a treaty referendum â€“ any treaty referendum â€“ with the ICM poll identifying 49% of the population favouring Britain leaving the EU would be very difficult. The government would however be obliged to try; a similar situation to that which John Major found himself in over Maastricht. It is an extremely sharp set of options and the best solution would be to not get into the position of having to choose in the first place, which implies no treaty at all. But can the Eurozone crisis be finessed without one? On that, the fate of much turns.